UNITED KINGDOM: Four people were killed and 40 injured after being run over and stabbed in a lightning attack at the gates of British democracy attributed by police to “Islamist-related terrorism”. The attack unfolded yesterday (Mat 22) across Westminster Bridge in the shadow of Big Ben, a towering landmark that draws tourists by the millions and stands over Britain’s Houses of Parliament – the very image of London. The attacker’s car struck pedestrians on the bridge before crashing into the railings surrounding the heavily-guarded Houses of Parliament, sowing first shock then panic in the seat of British power. Prime Minister Theresa May described the attack as “sick and depraved” in a defiant address in which she affirmed parliament would meet as normal today (Mar 23). Standing outside her Downing Street residence after an emergency cabinet meeting, May said Britain’s alert level would be kept unchanged. “We will all move forward together, never giving in to terror and never allowing the voices of hate and evil to drive us apart,” said May, who was dressed in black. The prime minister was in parliament at the time of the attack and was seen being ushered away in a silver car as what sounded like gunfire rang out, British media reported. Britain’s top counter-terrorism officer Mark Rowley said the four victims included a policeman guarding parliament and three members of the public. “Islamist-related terrorism is our assumption,” Rowley told journalists. He said investigators believe they know the identity of the assailant and police would be examining the scene of the attack through the night. Queen Elizabeth II postponed her appearance to open the new headquarters of London’s Metropolitan Police yesterday, where the force’s flag was flown at half-mast following the incident. The attack came a year to the day after Islamic State jihadists killed 32 people in twin bomb attacks in Brussels and after a series of deadly assaults in Europe that had hitherto spared Britain. Parliament was locked down for several hours and hundreds of lawmakers and visitors were later evacuated to nearby Westminster Abbey and the Metropolitan Police headquarters. An air ambulance flew in and police cordoned off a large area, while tourists on the London Eye, a popular visitor attraction, were stuck up to 135 metres in the air for more than an hour during the incident. “I saw three bodies lying on the ground and a whole lot of police. It was pretty terrifying,” said Jack Hutchinson, 16, from the United States, who was stranded on the observation wheel with his parents. Britain’s last terror attack was the assassination of MP Jo Cox by a pro-Nazi sympathiser in her constituency in northern England. The worst previous attack in London was in 2005 when four British suicide bombers inspired by Al-Qaeda attacked the transport system, killing 52 people. Britain’s allies reacted with shock and vowed to stand with London in the fight against terror. US President Donald Trump and French President Francois Hollande both spoke to May and Chancellor Angela Merkel said Germany stood with Britons “against all forms of terrorism”. Lights on the Eiffel Tower in Paris were switched off at midnight in solidarity with victims of the attack. French Foreign Minister Jean-Marc Ayrault is due to travel to London this morning to visit three French pupils on a school trip who were among those hurt. Five South Korean tourists were wounded, the Yonhap news agency reported, while the Romanian foreign ministry said two Romanians were also injured. A doctor at nearby St Thomas’ Hospital said they were treating people with “catastrophic” injuries. Press Association news agency photos believed to be of the attacker lying on an ambulance stretcher showed he was wearing black clothes and had a beard. British lawmaker Mary Creagh said there was “a real sense of panic” as the attack unfolded. 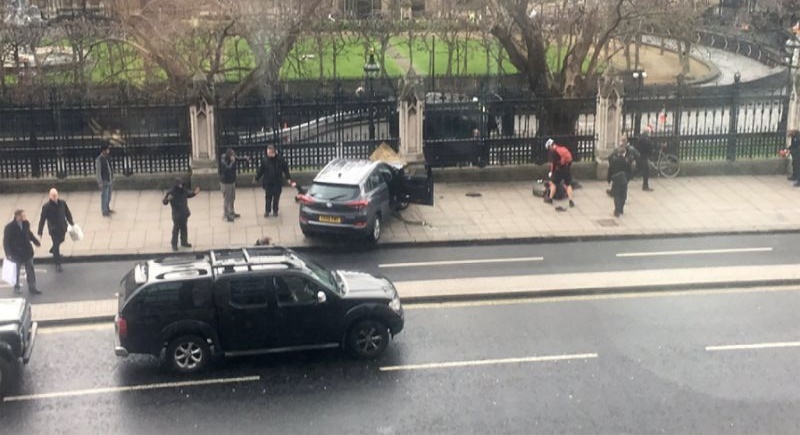 Pictures showed two people being attended to on the ground inside the vehicle entrance gates of parliament, with a knife visible on the cobblestones, while three shots were heard on video footage.